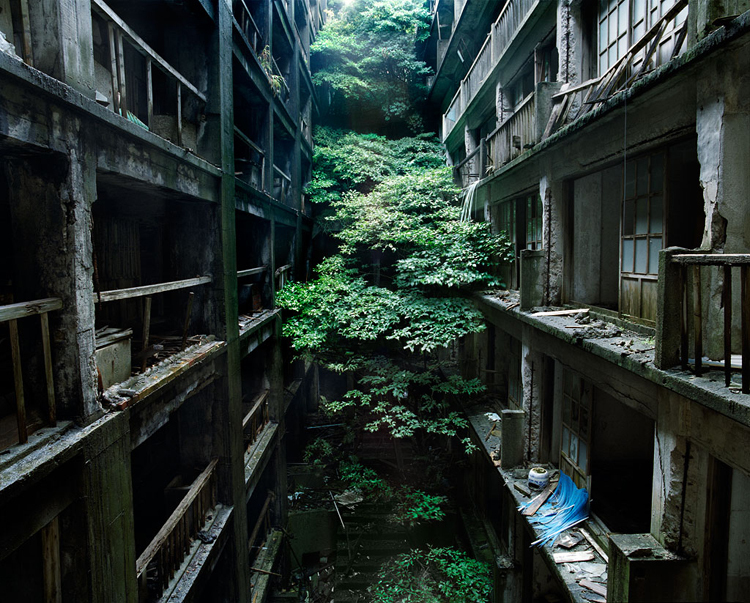 fototazo: The Image: Thomas Jorion, "Fukkatsu"
The Image: Thomas Jorion, "Fukkatsu"
I did this image in 2008, on the Gunkanjima island, when I went to Japan for the first time. I was fascinated by this island, uninhabited since 1974. My trip was motivated only by this visit. However, I keep in my mind a memory of this trip mixed of both pleasure and fear. To walk among ghostly buildings is actually not what I'm interested in. On the contrary, I have realized that I was attracted by the "reborn" aspect of the place. This rebirth is visible thanks to the insects and birds that made this place their home. But also by the plants that have grown and covered the buildings. I took this picture using the Mamiya I used back then, in the last few minutes before leaving the island. These trees that grow in between the buildings, searching for the light, are fascinating to me. This mixture of mineral and plants summarizes everything I like to take pictures of. This picture is part of my series called "Konbini." This series talks about consumerism in Japanese society and its excesses such as ending mining exploitation on this island in favor of coal importation, even if it meant to abandon everything on site. Indeed, we can't see it in this picture, but the apartments were left as is and are filled with previous owners' personal effects. That's what I talk about with this series. Consumerism pushes us to create more, in order to buy more, and then throw away more. It never ends. Today, it is a speech that begins to find its echo, but it seems important to me to keep on illustrating it through images such as these. Now with a bit of perspective, I always look at this picture with the same pleasure. Since then, I have had the luck to visit other places that have fascinated me and mixed all the ingredients that I love in photographs. I'm in the process of making a book with an editor, that will be published in October 2013. It traces back over the last six years of my photography. I am happy that this picture is part of it.